Minneapolis, MN, USA - June 12, 2006 - cStar Technologies, a provider of wireless cashless vending solutions, Northwind, a PMS solutions provider and Kaba, an access control system provider, have collaborated to showcase guest keycard cashless vending technology at the HITEC 2006 GUESTROOM 2010 Pavilion. cStar's cashless vending solution, Vending Genie™ Hospitality has been seamlessly interfaced with Northwind's Maestro and Kaba's ATLAS to deliver this innovative cashless vending technology specifically for the hotel environment. Activated by the guest keycard, this is the only cashless vending solution that eliminates cash in the vending machines, by wirelessly approving and posting transactions to the guest folio for payment at checkout. Initial testing and deployment of the system produced overwhelming results - extremely positive customer experience feedback, 100% proprietor approval and 99.9% system reliability. The owners and staff of the hotel were ecstatic with the cashless vending deployment. cStar's wireless connectivity is based on easily deployable wireless LAN and eliminates the cost of running dedicated cables, providing the flexibility in vending machine locations within hotels. There is no monthly communication charge for the wireless LAN connectivity. HITEC visitors will be able to experience this new technology in the GUESTROOM 2010 Pavilion as well as in the Kaba Lodging Systems booth (# 841). Attendees will swipe guest room key cards (encoded at the Kaba Lodging System booth) to simulate purchasing beverages from the vending machines. The charges will show up in the guest billing on the Maestro PMS client terminal display in real time. ATLAS is the industry's first ASP .Net based access control system to provide hotel systems interoperability using Web Service technology. ATLAS easily integrates with any hotel's existing IT infrastructure and provides compatibility with other vendor systems using Web Services. cStar Technologies Inc. is a global provider of wireless (LAN/WAN) data communication solutions for M2M (Machine-to-Machine/Men) and mobile commerce applications. Protected by multiple patents, its core solutions include cashless wireless vending and RFID life science applications. Vending Genie™ Hospitality solution turns the existing cash based hotel vending machines into cashless point-of-sale devices interfacing with the hotel PMS for card validation, credit check and transaction posting. With its robust wireless network communication, the vending machines can be readily deployed anywhere in the hotel without any wiring. Northwind, known in the hospitality industry for its service and state-of-the-art technology, is widely respected for providing hotels, private organizations, and corporate management companies with flexible software solutions. Based in Markham, Ontario, Canada, with a network of dealers and offices worldwide, Northwind is a leading supplier of software for all types of hospitality operations including hotels, resorts, timeshares, condominiums, seminaries, state parks, and clubs. Maestro applications are engineered for operators who need to manage their enterprise in a real time environment for the utmost operational control and profitability. 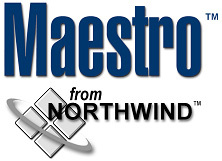 Designed to maximize the efficiency of any size single hotel or multi-property enterprise, Northwind's Maestro solution offers the most productive working environment, which includes the following suite of products: PMS, Sales & Catering, Club/Spa Management, Corporate Reservations Office, Multi-Property Management, Condo/Owner Management, Yield Management, POS & Online Table Res, GDS Connectivity and ResEze Internet Reservations. This comprehensive multi-platform (Windows 2000/XP, Unix/Linux, Terminal Server & Web Enabled) suite is recognized as the solution of choice for progressive and demanding organizations. NORTHWIND is a total solution provider that offers leading-edge technologies, and unparalleled training and support.